The idea to treat your allergies with raw honey is not a new one. My sister-in-law and her husband are currently living fully off grid – no wires or pipes going to their house. They have dreamed of doing so for many many years so it’s been fun seeing their dream realized. They’ve taught me a lot about doing things naturally. They were actually instrumental in getting me started down this natural path. It was my brother-in-law who first told me about eating honey for allergies. He’s always suffered from really bad environmental allergies in May, so he started eating honey throughout the year that was farmed from their immediate area. His allergies are so much better now! So, what are the details?…. There is no money for drug companies if people eat honey for their allergies. Therefore, you will not find many studies done on this. One study is from The International Archives of Allergy and Immunology. The people in the study had 70% fewer days with severe symptoms and used 50% less antihistamines. Logically, from what we’ve learned about allergies, it makes sense. When you have an allergic reaction, your body is reacting to a substance as if it were poison and would kill you. The body goes into full defense mode and sometimes reacts to such a degree that it is life threatening (yeah, kind of defeats the purpose). Well, immunotherapy is the idea of introducing a substance that your body reacts to in tiny tiny degrees; training your body to not react. When people get allergy shots, this is what they are doing: slowly giving their body a tiny bit of the substance they are allergic to in order to train the body not to produce histamine as a reaction. Real Honey can be harder to find than you think. Not only is there a mixture of corn syrup in a lot of honey on the shelf, but most have the pollen refined out of them so you cannot tell where they came from (scientifically, pollen is like a gps coordinate). This is dangerous since many places like China and India have tried to sell honey full of antibiotics and heavy metals. In 2011, Food Safety News took over 60 samples from over 10 American States and 76% of them from grocery stores were without pollen, while 100% of those from pharmacies were without pollen. (Food Safety News). So buying honey bear off the shelf at your local grocery store is not good enough….unless you know more about it. For Pollen to work as immunotherapy, it must contain pollen and it must be local. Unless you live in a frozen tundra, you probably have someone near you who sells honey from their own bees. Look around in the local stores, ask friends, and find local honey. The reason it needs to be local honey is because the pollen will be from plants that you are constantly exposed to. That’s what you need, not some foreign plants that you will never see or react to. Though, say if you live in PA, USA and get some honey in Tennessee, or even Colorado, there is probably enough cross over in plants that it will be very beneficial. Hopefully they will look at you like your crazy to the first and second questions. 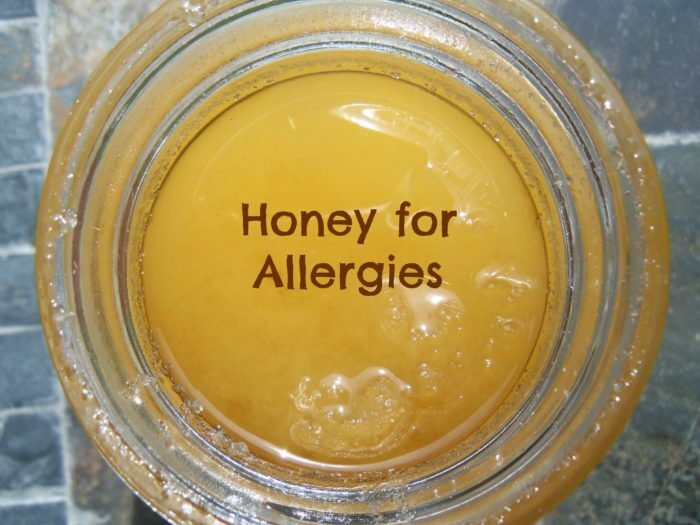 I would suggest 2-4 teaspoons of raw local honey per day for several months prior to your allergy season. This, along with a very healthy diet (making sure you have a healthy gut), will help you along your journey to be allergy free! great article! 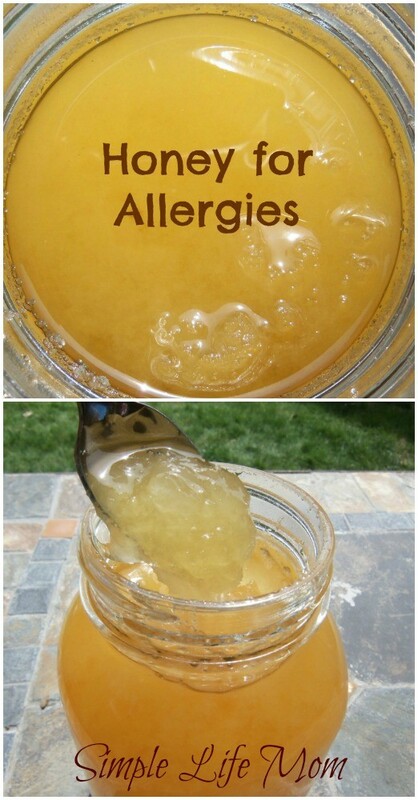 I use local honey for my son’s allergies and it has been extremely helpful. This is such a great explanation of this helpful remedy. Thanks for the great read! Thanks for sharing this great post on Green Thumb Thursday! My family suffers from seasonal allergies with this time of year being the worst. I will have to research and find some good local honey and try it out. 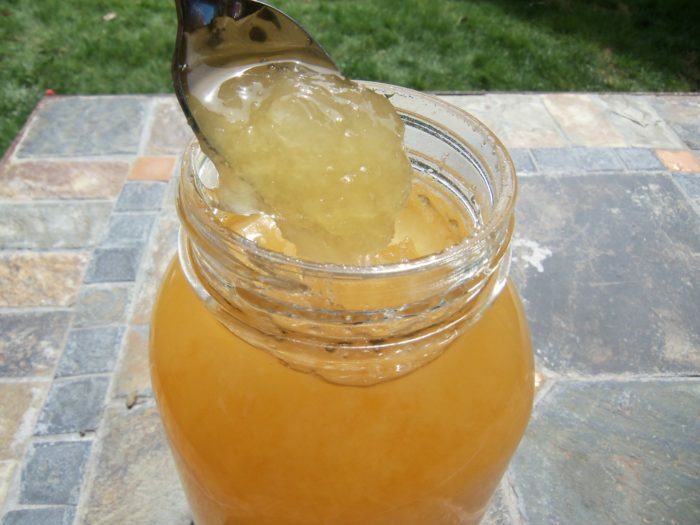 Great post and raw honey to me one of Nature’s true miracles. for many health problem including allergies. Thanks for sharing on Real Food Fridays Blog Hop. Shared on Pinterest. So, before I found out the general consensus in the baby community recommends waiting until your baby is two before feeding them honey, I bought raw honey at my farmers market and feed it to my little guy… He was just under a year. It doesn’t hurt him any, and he has no allergies to date (he’s 8 yes old now), which is pretty amazing because both my husband’s family and my family are plagued by terrible allergies to just about everything. Yes, botulism is rare, but those who get it suffer from paralysis or death when they are too tiny to fight it off. Luckily, one year is not a long time to wait before introducing honey. Now I know the issue….I waited until my allergies were in full swing to try this. Oh well. It didn’t work but I love raw honey so I guess it wasn’t a total loss. Can it battle tree pollens somehow? Our cars get covered in enough tree pollen in April and May that each day you can write “wash me” in the pollen, wash it, and write it very clearly the next day. On an odd side note, since I love honey so much….when in labor with my second child (first was such a fast, early labor I didn’t get to prepare) I went into the local health store and bought those straws of honey (local honey) while IN labor (I made a scene…..) and when the nurses were absent, I had honey. The hospitals forbid any drinks, food, anything from the second you’re admitted to after birth so I decided screw it….I’m breaking the rules. I know honey can help my blood sugar and has health benefits! Yes, you have to start before hand, it needs to be local raw, and good honey with no corn syrup. Bees go to the trees too so it should help with any tree allergies. And, raw honey tastes better! The bees pollinate the local crops and wildflowers and produce more fruit naturally and we get amazing tasting honey and hopefully some allergy relief. Win – Win – Win! This was very helpful info. We have lots of local honey available and will be looking into buying more honey from the local farmers. Thanks for sharing this on Merry Monday. Hmmm, I’ve never heard of that. You’re obviously super sensitive to something in it. All I can think of is there is some kind of pollen in it I’m allergic to maybe. From what I’ve read, people with a honey allergy are usually very allergic to one of the plants used for pollination and are usually highly allergic to bee sting venom. Hi Kelly, I liked your post so much that I choose it as one of the features on this weeks Real Food Fridays Blog Hop. Have a healthy happy weekend. Looking forward to what your be sharing this week. I’ve known about this for awhile, yet I keep forgetting to try it every spring. I have plenty of raw honey, but I need to find some local stuff as I’m almost out of it! We are lucky enough to have a few different apiaries in my region that sells honey at the local farmer’s markets, and for a very reasonable price! I stopped buying honey at the grocery store about a year ago.